The model painted like its prototype TEP70BS-087 at November 2011, when it works at Krasnodar depot of North Caucasian railroad. USING THIS DIESEL LOCOMOTIVE TEP70BS ON ANY OTHER SITES WITHOUT PERMISSION OF AUTHORS AND ADMINISTRATORS IS PROHIBITED! ATTENTION! FOR CORRECT USING OF THIS LOCOMOTIVE YOU NEED TO DOWNLOAD CABVIEW 1 FOR TEP70BS AND SOUNDS 2 FOR TEP70! The model painted like its prototype TEP70BS-151 at 2011, when it works at Saratov depot of Privolzhskaya (Near Volga) railroad. The model painted like its prototype TEP70U-004 at July 2007, when it works at Tyumen depot of Sverdlovsk railroad. 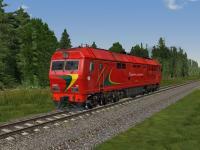 USING THIS DIESEL LOCOMOTIVE TEP70U ON ANY OTHER SITES WITHOUT PERMISSION OF AUTHORS AND ADMINISTRATORS IS PROHIBITED! ATTENTION! FOR CORRECT USING OF THIS LOCOMOTIVE YOU NEED TO DOWNLOAD CABVIEW 1 FOR TEP70BS VER. 1.1 OR NEWEST AND SOUNDS 2 FOR TEP70 VER. 1.2 OR NEWEST! ATTENTION! FOR CORRECT USING OF THIS LOCOMOTIVE YOU NEED TO DOWNLOAD CABVIEW 1 FOR TEP70BS AND SOUNDS 2 FOR TEP70 VER. 1.2 OR NEWEST! The model painted like its prototype TEP70BS-111 at March 2010, when it works at Minsk-Sorting depot. IT'S NECESSERY USING TEP70BS, TEP70U and 2TE70 LOCOMOTIVES!